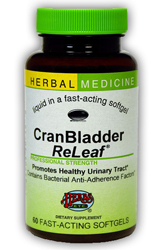 CranBladder ReLeaf®, by Herbs Etc., maintains a healthy urinary tract and supports healthy bladder walls especially when the urine is strongly acidic or alkaline. Healthy bladder walls also support the secretion of bacterial anti-adherence factors. Stimulates the urinary tract immune system, acidifies the urine and tones the urinary passages. Ingredients: Cranberry fruit, Uva-Ursi leaf, Echinacea angustifolia root, fresh Stinging Nettle herb, Buchu leaf, fresh Horsetail herb, Pipsissewa herb, fresh Yarrow flowering top, Meadowsweet herb, Licorice root and Stevia herb. Gluten Free. Suggested Use: Acute: Take one softgel or 30 drops with water every two to three hours. Proactive: Take one softgel or 30 drops twice a day with water. Ingredients: Alcohol free concentrated extracts of: Cranberry (fruit), Uva-ursi (leaf), Echinacea angustifolia (root), fresh Stinging Nettle (herb), Buchu (leaf), fresh Horsetail (herb), Pipsissewa (herb), fresh Yarrow (flower top), Meadowsweet (herb), Licorice (root) and Stevia (herb). Other ingredients: Extra virgin olive oil, sunflower lecithin, beeswax, Softgel shell contains gelatin, vegetable glycerine, carob and chlorophyll.